I would like to see a movie about Bill McKechnie. William McKechnie was a third baseman and later a manager and coach in Major League Baseball. McKechnie grow up in the suburbs of Pittsburgh and was a life-long resident of the Pittsburgh area. My interest in Bill McKechnie is a result of an encounter my father had with him in the early 1930's. My dad was a left-handed pitcher in the Pittsburgh suburb of Wilkinsburg. McKechnie, who at the time was managing the Boston Braves, gave my dad a tryout for the team. Dad had the usual repertoire of pitches for the times of a fastball and curve. What he stood out for though was his knuckle curve that would float on in and break down and in for right handed batters and down and away for the left handers. He threw that pitch often to me when we played catch. Dad had his day with Mr. McKechnie but it did not turn out as hoped for. Obviously dissappointed that he did not make it, the experience remained a pleasant memory until my father's death. Baseball always meant alot to dad and as he lay dying in the hospital, he asked my brother, "Do you think that they play baseball in heaven?" Dad was 89 when he died. He was fifteen when McKechnie gave him that tryout some seventy-four years earlier. I tell you all that to tell you this. In 1944, McKechnie had to get permission from a school for one of its students to pitch in the Major Leagues. Joe Nuxhall a 15 year old left-hander, who was pitching to seventh, eight and ninth graders one day, was now pitching for the Cincinnati Reds of the National League. McKechnie had confidence in young left handed pitchers. 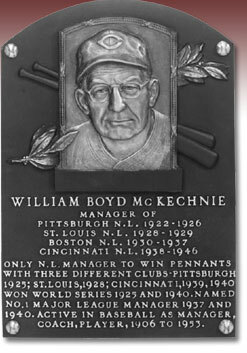 McKechnie won World Series titles with the 1925 Pittsburgh Pirates and 1940 Cincinnati Reds. He compiled 1,892 career victories ranked fourth in major league history when he ended his managing career in 1946. McKechnie was elected to Hall of Fame in 1962. I believe that there is a movie somewhere in the life of Bill McKechnie. Join in and write your own page! It's easy to do. How? Simply click here to return to Best Sports Movie That Hasn't Been Made Yet.